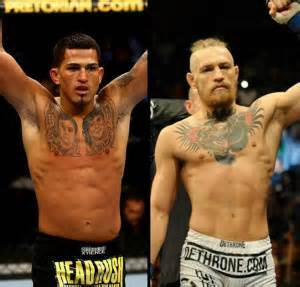 Two of the flashiest fighters in the sport today, Anthony “Showtime” Pettis and “The Notorious” Conor McGregor have changed the game for striking in the UFC. Two remarkable athletes who demonstrate freakish dexterity and diversity in their attacks, both are calm, collected, and truly sublime strikers who have demonstrated incredible knockout power in every limb. Conor McGregor is already eyeing the Lightweight Belt, stating clearly his belief that after defeating longtime featherweight kingpin Jose Aldo, there will be no more challenges left in the division for him. As a result, the list of potential opponents for the brash Irishman is endless. The match-up that has most pundits drooling, however, is the potential clash between McGregor and the former Lightweight champion in Pettis. A taekwondo blackbelt with an astonishing submission prowess, Pettis has cleaned up a laundry list of the best lightweights on the planet in Benson Henderson, Donald Cerrone and Gilbert Melendez (to name a few) before losing his title to current champion Rafael Dos Anjos. Assuming Pettis wins his upcoming battle in Boston against former Bellator champion Eddie Alvarez, and McGregor makes good on his plans for Aldo and a weight-class change, it’s likely that the two could face one another in a title eliminator for the UFC Lightweight strap. Pettis and McGregor are phenomenal strikers in their own right, and both demonstrate a very flashy and visually stimulating attack. That said, when it comes to the actual knockout blow, the fighters couldn’t be any more different. McGregor is extremely active with his kicks out of the gate. He utilizes a high-volume kicking game centered on various spinning kicks and a brutally affective front snap-kick to the body. However, the usage of those flashy techniques, are really little more that elaborate set-ups. Every time “Notorious” lands his killing blow, he does so with a basic, bread-and-butter boxing attack once his opponents become infatuated by the kicks. Take, for example, McGregor’s recent interim title-fight against perennial top 3 fighter Chad Mendes. Despite Mendes’ incredible takedowns and knockout power, he was consistently caught on the end of McGregor’s front kicks, repeatedly taking shots to his midsection from the lanky Irishman and losing more and more breath with each connected kick. However, once Mendes was weathered down and his cardio began to waver, Conor switched from his Caoperia/Taekwondo attack to a more traditional boxing stance, and utilized his phenomenally accurate straight punches to target Mendes’s chin, who’s hands had dropped significantly in anticipation of the body shots. I will take note however that while McGregor has an excellent chin, Dustin Porier and Chad Mendes were able to land some strong shots in their respective battles with “Notorious”. Pettis is similar in set-up, but quite the opposite in closing the deal. Pettis too has a ruthlessly effective kicking game and flashy style, where he will often attack off of the cage, flying through the air, and at bizarre angles. However, when he smells blood, his style doesn’t revert to any sort of basic stance, but remains spectacular, as evidenced by his remarkable list of kick knockouts. Whether it be Donald Cerrone’s liver, Joe Lauzon’s brain, or Benson Henderson’s soul, Pettis will launch exciting kicks to any and all areas of his opponent’s body, and when they land, they’re devastating. However, like McGregor, Pettis’s defense has shown some small holes, as evidenced by his fight with Dos Anjos, where he suffered a broken orbital bone, courtesy of the Brazilian. If there is one thing that Chad Mendes exposed in McGregor’s background, it’s that the Irishman needs serious work in his ground-game and takedown defense. The powerful wrestler shocked the audience at UFC 189, as Mendes dominated McGregor from the get-go, taking him down several times and slamming the Irishman to the mat with authority. Once the fight hit the mat, Mendes unleashed some ferocious ground and pound on a seemingly helpless McGregor, who seemed content to wait for the stand up as opposed to attempt a submission or sweep to get up. Pettis has also proven to be subject to being taken down, though his defense is significantly better than his Irish rival’s. A high-school wrestler himself, Pettis has suffered losses to takedowns in the UFC to Clay Guida, but showed significantly improved Takedown Defense against Ben Henderson and Gilbert Melendez. Also, a gifted jiu-jitsu practitioner and training partner of Olympic wrestler “Funky” Ben Askren, if you do get “Showtime” to the mat, you may get all you can handle in submission attempts. We don’t know enough about McGregor’s finishing ability on the mat because he usually finishes the fight before it gets to that point. That said, we’ve seen him on the bottom against a truly top-level wrestler in Chad Mendes in his last fight…and it wasn’t pretty. The Irishman took a serious beating at the hands of the bruising Team Alpha Male fighter on the bottom, and was it not for his insane toughness, could have been in serious trouble. He trains with Icelandic Jiu-Jitsu Phenom Gunnar Neilson, so he certainly has access to truly world-class training partners, but Conor’s proven to be no real threat from the ground, and has suffered both of his career defeats by submission. Pettis has a serious advantage if the fight hits the mat, but I doubt he will choose to bring it there. That said, should the former champ decide to get the takedown, he has the ability to finish the fight on the ground by locking up a submission. He has tapped gifted submission artists like Ben Henderson and Gilbert Melendez by armbar and guillotine, so his skills on the mat are quite multi-faceted. Here is where Pettis can steal the show. While “Showtime” has the ground-game to dispatch the Irish knockout artist, he wont. Pettis knows that he’s as gifted a striker as anyone on the planet, and now that McGregor has questioned his skill, will look to beat the Irishman where he is best, on the feet. Will he succeed? Honestly…he very well could. This is one of the hardest fights I’ve ever had to analyze, as both individual fighters are genuinely masterful strikers. What I will say, however…is that while McGregor has seen incredible success, unless he beats Jose Aldo in December, he’s never really dispatched an especially gifted striker. His competition in the striking department so far has been pretty average, and for a fighter of his caliber, McGregor was able to pick them apart with ease. Pettis has knocked out one of the best kickboxers in the game such as Donald “Cowboy” Cerrone, and has proven that he can out-strike anyone willing to engage him in the stand-up so far…but has he ever faced as dynamic a striker as McGregor? This fight would be an absolute striking clinic, as the crowd would be treated to a battle between two genuinely elite knockout artists with a flair for the dramatic. I’m taking the less popular option for my winner, though, as I need to see McGregor match up with a truly elite striker before I can give him the nod. Next Article » Is Theo Epstein the GOAT?